What would Ben Franklin have drunk? 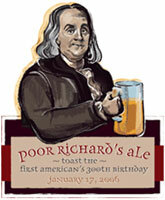 Perhaps something like Poor Richard’s Ale, the beer that officially goes on tap tomorrow to commemorate the 300th anniversary of Franklin’s birth (Jan. 17). OK, some of the 100 or so breweries across the country that brewed this special beer already have it on at others the beer isn’t quite ready to serve, but the Tuesday is the day to raise a glass to Ben. So before you ask, here are a few answers. Where can I find the beer? The Brewers Association has compiled a list. Even brewing giants Anheuser-Busch is involved. Its St. Louis Brewery will offer Poor Richard’s Ale to guests who visit its Tour Center from 10 a.m. to 4 p.m. A special toast led by a Benjamin Franklin historical role performer and A-B brewmaster will be conducted at 1:30 p.m. to honor the real Benjamin Franklin. How was the recipe chosen chosen? The Brewers Association held a competition to identify a suitable recipe. A panel of award-winning brewers and others with an eye toward history chose the recipe for Poor Richard’s Ale. What makes the beer different? For one thing, molasses and corn. As Simmons noted, “Modern appreciation for the characteristic molasses flavor is limited at best.” However both were common in ale during colonial times and each would have helped to reduce the colonists’ dependence on imported British ingredients. Will every batch taste the same? All of them except one will follow a recipe for Poor Richard’s Ale that emulates a beer the forefathers might have enjoyed after a heated democratic debate. The exception – you guessed it – is Utah, where not even American history can trump the 3.2 beer law. “The rest of the country is going back to colonial times, but we’re going back to Prohibition,” joked Matt Beamer, head brewer at Park City’s Wasatch Brew Pub, the only Utah brewery participating in the anniversary celebration. Beamer said he would love to join his national brewing colleagues and make the original ale, which contains 6.6 percent alcohol. But since Utah liquor laws prevent that, “I’ve just decided to have fun with it,” he said. The best part is that this beer will be enjoyed on draft in pubs and taverns, where people still gather to talk – about beer, the football playoffs, maybe even revolution – just as Ben Franklin and his friends did nearly 300 years ago.